With the coding regions of the murine Oct4, Sox2, Klf4, and cMyc genes, the pCOBLW (CAG-Oct4-Sox2-Klf4-Myc-GFP-SV40-Neo) Mouse Reprogramming PhiC31 Donor Plasmid can be used for one-step, non-viral generation of mouse iPSCs. The major advantage of the PhiC31 Integrase system is the tight control over copy number—the majority of clones that undergo integration events have single insertions (Supporting Data, Figure 1), reducing the risks of insertional mutagenesis effects. 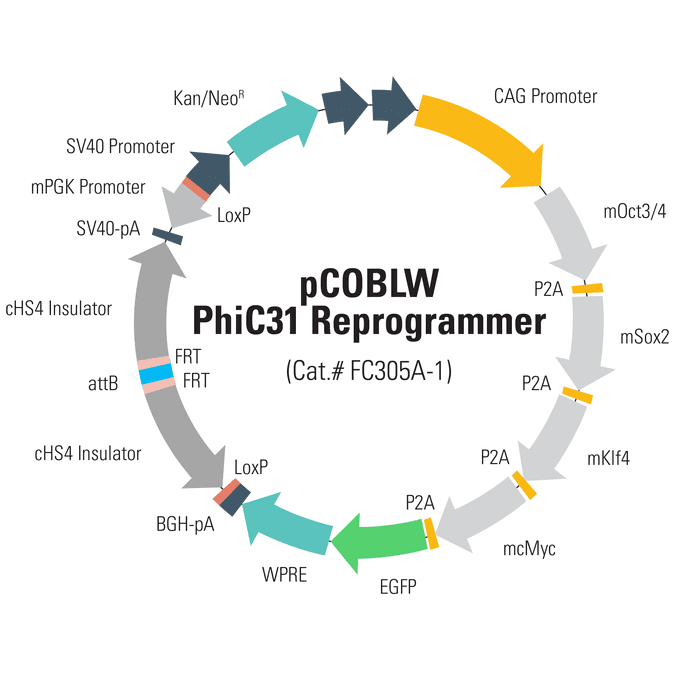 Popularly used for gene therapy development applications, the pCOBLW Reprogramming PhiC31 Donor Plasmid features the iPSC factors co-expressed by a potent CAG promoter. Co-expression is coordinated by the P2A elements at the 3’ end of each iPSC factor, including before the EGFP reporter gene. HS4 insulators flank the expression cassette and a functional attB site directs the integration of the entire plasmid into pseudo attP sites in any genome. The vector is engineered with FRT sites for later excision using standard FLP recombinase methods. You can monitor co-transfection of the reprogramming vector with the PhiC31 Expression Plasmid (Cat.# FC200PA-1) using GFP fluorescence and select for positive colonies using the built-in neomycin resistance marker. Figure 1. With the PhiC31 Integrase-based reprogramming system, the majority of clones that undergo integration events have single insertions. Southern blot analysis of genomic DNA from positive clones co-transfected with both the PhiC31 Integrase Expression Plasmid (Cat.# FC200PA-1) and the pCOBLW (CAG-Oct4-Sox2-Klf4-Myc-GFP-SV40-Neo) Mouse Reprogramming PhiC31 Donor Plasmid shows the copy number status for 16 different iPSC lines. With both restriction enzymes used, 14 out of 16 lines show single insertions (88%) demonstrating the tight copy number control possible with the PhiC31 Integrase System. Figure 2. The PhiC31 Integrase System efficiently generates mouse pluripotent stem cells. Mouse iPSCs were generated by nucleofecting genetically unmodified C57BL/6 mouse embryonic fibroblasts with the pCOBLW (CAG-Oct4-Sox2-Klf4-Myc-GFP-SV40-Neo) Mouse Reprogramming PhiC31 Donor Plasmid (Cat# FC305A-1) and the PhiC31 Integrase Expression Plasmid (Cat.# FC200PA-1). iPSC cells were derived using morphological selection criteria and GFP expression without drug selection. When cultured under standard mouse ES cell culture conditions, the morphology of SBI mouse iPSCs are identical to that of mouse ES cells. The cells also express the pluripotency markers SSEA-1, Nanog, Sox2, and Oct4 and demonstrate strong endogenous AP activity.